Note: The PVD mean that it is the best high quality plating,normal it can be used more than 2 years and not fade. 1. Only the best and high-grade materials were selected and processed under strict quality controls. 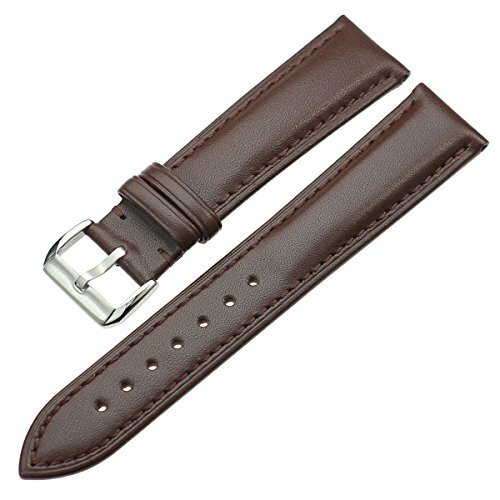 We use full grain Italian top layer calfskin leather for this strap which owns its silky shine through matte finish. Moderate padding and premium leather provide maximum breathability, comfort and style. 2.Quick Release Spring Bar: Easy to swap watch straps in seconds, what you need to do is just slide the knob with finger to release or attach strap. 3. It's classical design styles and made for your luxury watches. It can be applied to watches with standard straight lug ends, such as fit for Tissot, Longines, IWC, Rolex, Mido, Omega, Armani, Cartier, Tudor, Movado, Rado, Hamilton, Titoni, Certina, Calvin Klein, Swiss Military, MontBlanc, Girard-Perregaux, Carl F.Bucherer, Armani, Kronsegler, Jaeger, Invicta, Zenith, Ranceas, Timex, DAVOSA, Oris, etc. 4.Every watch band has a leather hangtag, which can check the leather material and quality by yourself. WIDTH (Watch Lug X Buckle End): 18mm X 16mm,20mm X 18mm,22mm X 20mm,24mm X 20mm; LENGTH (Long Belt + Short Belt): 115mm + 75mm,120mm + 75mm,120mm + 75mm,120mm + 75mm; Thickness: 2mm ~ 4mm; Designed to fit wrists 5.35" to 8", but watch geometry also impacts fit. Classical design styles and made for your luxury watches. It can be applied to watches with standard straight lug ends, such as Tissot, Longines, IWC, Rolex, Mido, Omega, Armani, Cartier, Tudor, Movado, Rado, Hamilton, Titoni, Certina, Calvin Klein, Swiss Military, MontBlanc, Girard-Perregaux, Carl F.Bucherer, Armani, Kronsegler, Jaeger, Invicta, Zenith, Ranceas, Timex, DAVOSA, Oris, etc. 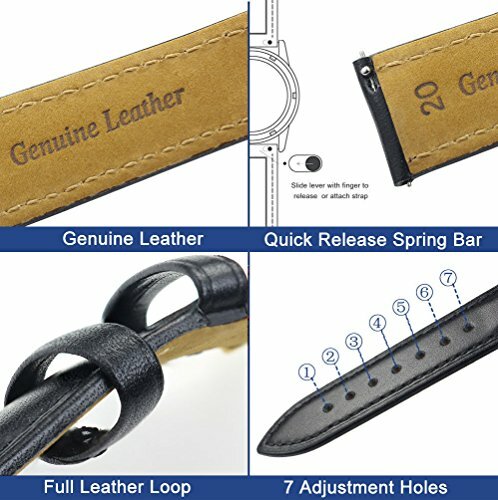 Quick Release Spring Bar: Easy to swap watch straps in seconds, what you need to do is just slide the knob with finger to release or attach strap. Only the best and high-grade materials were selected and processed under strict quality controls. We use full grain Italian top layer calfskin leather for this strap which owns its silky shine through matte finish. Moderate padding and premium leather provide maximum breathability, comfort and style. 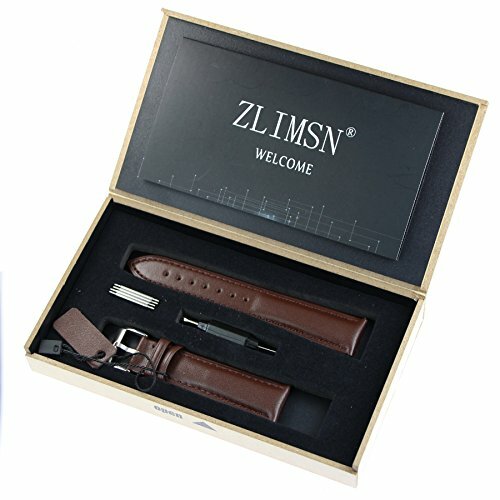 Every watch band has a leather hangtag, which can check the leather material and quality by yourself.